At ICC’s second annual Supply Chain Financing Summit, on 6-7 November in Paris, leading bankers and corporate executives will debate their latest strategies in the fast developing area of supply chain finance. Participants registering before 27 September will benefit from a special early-bird rate. In today’s volatile economic climate, the need for working capital solutions is stronger than ever. Companies and suppliers are facing conflicting pressures to improve payment terms, reduce prices and improve cash flow efficiencies. In response, ICC and its Banking Commission have been focusing on establishing new financial solutions that enable corporate executives to maintain a resilient supply chain. 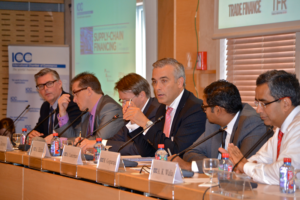 The annual ICC Supply Chain Financing Summit is an essential part of this engagement. Organized by the ICC Banking Commission, a leading global policy and rule-making body for the banking industry, this is the only officially accredited annual Supply Chain Financing summit in the world. All attendees will receive an ICC certificate at the close of the summit allowing them to claim 12 PDUs accredited by the Institute of Financial Services as a course for the Certified Documentary Credit Specialist Recertification programme. The programme combines educational sessions on supply chain finance techniques while drawing on case studies and examples of best practice. Attendees will gain insight into a wide range of topics including: the streamlining of trade finance operations; the changing landscape from the BPO perspective; the impact of the regulatory environment and dealing with logistical hurdles. “ICC is working continuously on new rules and guidelines for international banking practice, with supply chain financing developing particularly quickly, so we’re looking forward to some exciting discussions at this year’s summit,” said Thierry Senechal, Senior Policy Manager, ICC Banking Commission. This second ICC Supply Chain Financing Summit builds on the success of last year’s event, which brought together professionals from 29 countries. Chief financial officers, corporate credit and risk managers, corporate treasurers, bankers, insurers, consultants and vendors working in trade and supply chain finance are all invited to attend.